Two possibilities on a loose strap jack - 1. It is loose on the outside of the guitar and 2. It is loose on the inside of the guitar. Starting with the easiest fix we will look at # 1. 1. The picture below shows an end view of the guitar with the strap button (strap removed). This button that holds the strap should be removable by twisting it counter clockwise by hand. If you get the strap button off (if not look at 1a. below) and if this is where the looseness is then the fix is fairly easy. An awl or nail is put through the jack shaft (as pictured above) and a special 1/2" wrench (special in that it is thin - about 1/16" thick - may be available at an auto supply store) is used to tighten the nut - carefully and not too tight or you can crack the finish. If the nut will not tighten - just turns the entire assembly and the awl - then we have to go inside. 1a. If you are having trouble getting the strap button off - maybe the whole assembly turns- then you may have to fashion a tool to hold the shaft from inside the jack hole. Look at the first picture above: You could take a nail or ice pick or awl and bend the tip to 90 degrees from the shaft. Then put it in the jack hole and work it into one of the shaft holes. If you can hold that you may be able to turn the strap button off by hand. Then try tightening the nut with a 1/2" thin wrench. 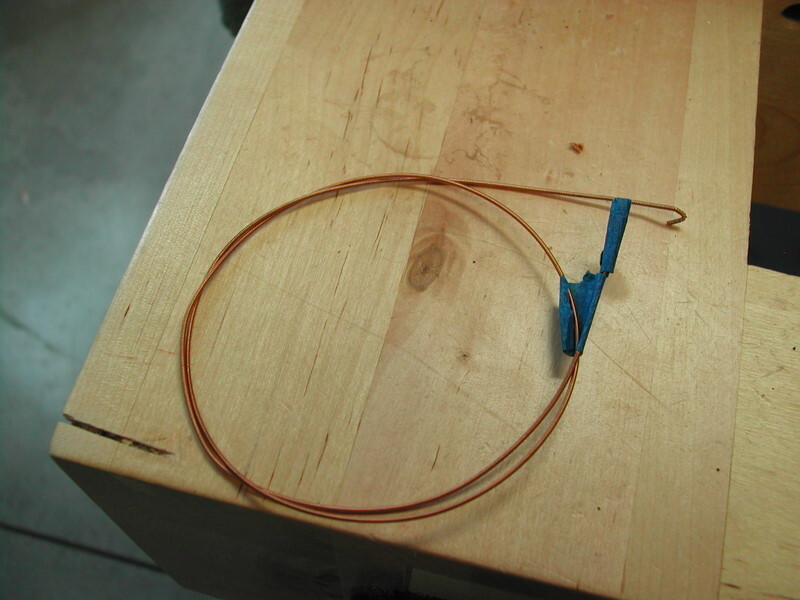 This is an E or A string about 15" long with a bend in one end and tape on the other end. The tape keeps the string from scratching the guitar - it can swing around while you are working on the jack assembly and scratch the guitar (don't ask me how I know that). Loosen or remove your strings so that you can get your hand inside the guitar. Put the hooked end through the hole in the jack shaft. See pic below. Put your left hand through the sound hole and find the wire that connects the saddle pick up to the strap jack. It should go from the saddle to a small clip and then to the strap jack. The clip is just folded over the wire to hold it away from side or top to keep it from vibrating. Carefully bend the clip up and it will release the wire - or it may have already released as these clips don't hold very well. 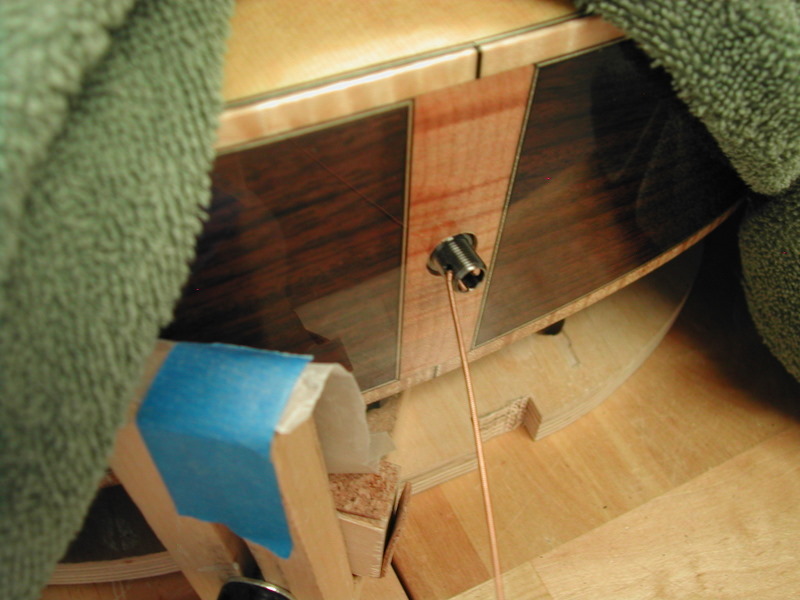 Now pull the wire toward the sound hole while keeping a little pressure on your string tool with your right hand. There is a washer and a lock washer on the inside that we don't want to fall off. They may come off but if the string tool stays connected to the strap jack they can only fall off onto the string. 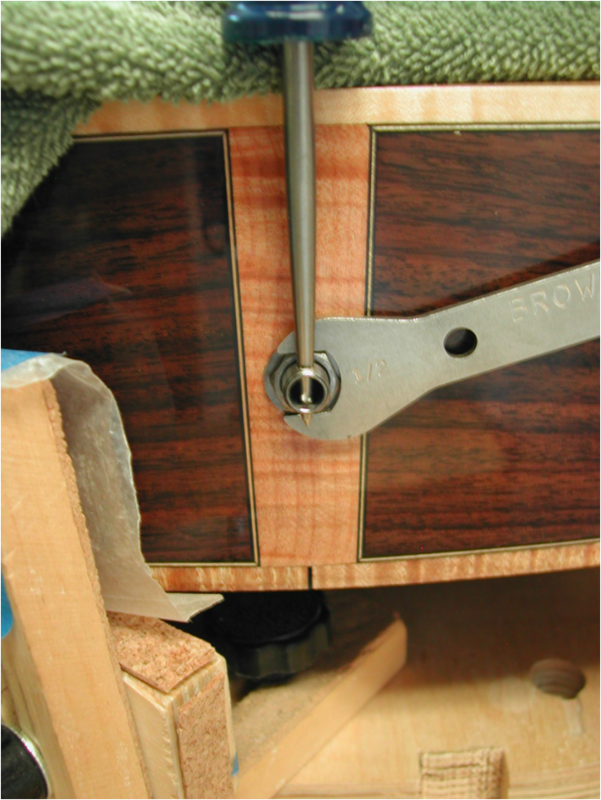 Move the assembly to the sound hole and after being sure that you have the 2 washers remove the string tool and pull the strap jack and 2 washers out the sound hole. I have one or two towels on the guitar to keep from accidental scratching. 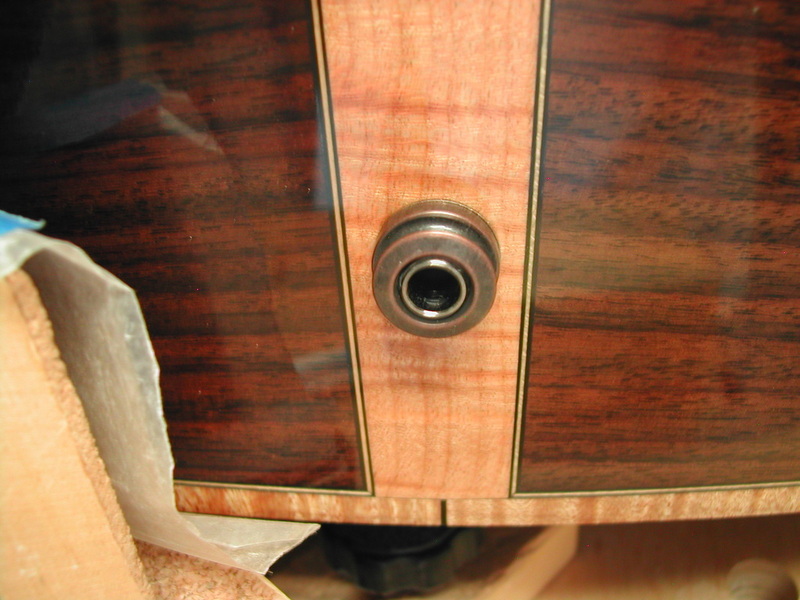 We want to shorten the threaded shaft that goes through the guitar end block. The part that I am holding is threaded onto the jack shaft and is locked there by the nut just to the right of my thumb and fingers and you can see the 2 washers that I talked about above. 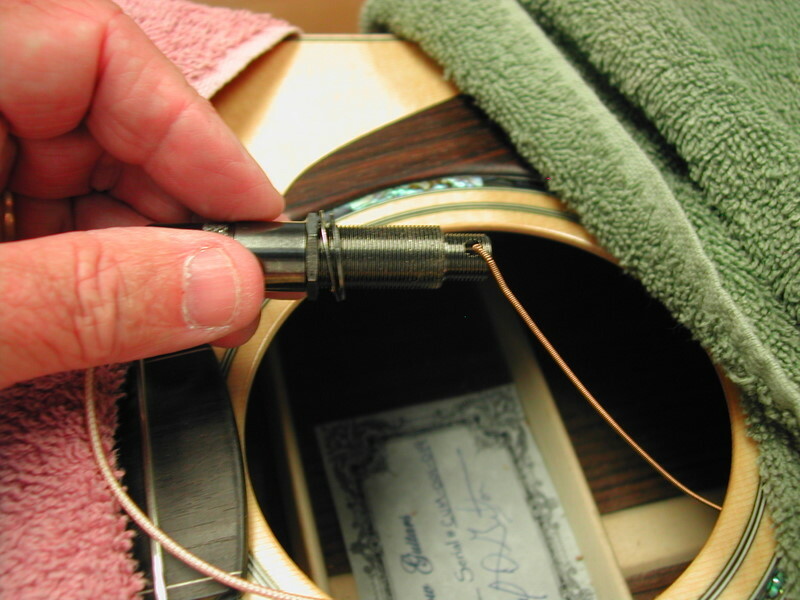 The string wire tool is removed from the shaft - just let it set in the bottom of the guitar. The part I'm holding has a knurled area just under my thumb. Get a hold of that part by the knurled area with a set of channel locks or pliers. Hold tight but be careful you can crush it. Take the appropriate sized wrench and turn the nut counter-clockwise to loosen it - that would be counterclockwise if you are looking at the nut from the right end of the assembly as pictured below. Now we are looking at getting this tight but still having enough jack sticking out the end of the guitar to plug into. So turn the nut counter-clockwise one turn. Screw the knurled piece up to the nut and tighten the nut. Holding your channel locks tight and tighten the nut to the knurled piece. They do tend to loosen up (and this could be why you have the problem now) so we want this tight but be careful you can crush the knurled part. Make sure the 2 washers are on and put the string tool back in the hole. With your left hand holding the wire and your right holding the string tool, pull the assembly back through the hole in the tail. Remove the string tool and put some pressure with one of your thumbs to hold the assembly in the hole. Work the washer and nut on. A little tricky but you can get it. When the nut clears the hole in the shaft you can put the awl back through the hole. Tighten the nut carefully. It should tighten and not want to turn the assembly. If we still have the looseness we need to remove it and try another counter-clockwise turn on the inside nut - repeat the above process. One or two tries should do it. Then re-install the strap button by hand. Get it tight and check it often.